We bring artistry back to outdoor lighting. We will give you a landscape lighting demo prior to starting and offer a lifetime warranty. Competitively priced. Servicing Elk Grove Village IL area. 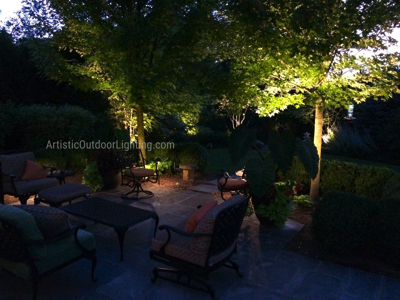 We are your premier source for landscape lighting and outdoor lighting Elk Grove Village. As 5-time Angie's List award winners serving you for 18 years, we offer 10 year guarantees on all installations and a free in-yard demonstration. We are experts in LED outdoor and landscape lighting and offer the highest level of attention to detail. It's been proven that when intruders see light, they move on to a darker home. Artistic Outdoor Lighting will not only enhance the beauty of your home and property, but your Elk Grove Village IL landscape lighting will get the added benefit of security. Feeling safe and secure, especially when you are home alone, is priceless. Also, the ambient light around your home will make paths and walkways safer for you, your family, and guests. Your family, guests, and even you, will be able to enjoy decks, porches, pools, and gardens late into the night. All of the spaces you enjoy about your home, and what relaxes you, can be expanded to double or triple the space you love now. You will now not be forced to return into your house after sunset. Your residential outdoor spaces will come alive and become even more beautiful as the stars fill the sky. Contact us now and let us show you how we can enhance the beauty and safety of your home and outdoor spaces. We will set up a complete, detailed demonstration that will duplicate exactly the way the final lighting installation will look. There is no guesswork. What you see is really what you get. At the time of the demonstration, diagrams, wiring charts, and photos will be made to ensure exact duplication at the time of installation. No other company goes to these lengths and pays as much attention to Elk Grove Village IL outdoor lighting detail. We also offer the latest in energy efficient landscape lighting, including LED and fluorescent lighting installation, ensuring that you continue to get the most cost effective lighting available. We also offer the latest in energy efficient landscape lighting, including LED and fluorescent lighting installation, ensuring that you continue to get the most cost effective lighting available. We also offer the latest in energy efficient landscape lighting, including LED and fluorescent lighting installation, ensuring that you continue to get the most cost effective lighting available. We are your Elk Grove Village outdoor landscape lighting experts.